Hi friends and fellow gardeners… It’s me again 🙂 I never intended to take such a long break from this dear space. A huge thank you if you’re back and reading. A huge thank you to those who have written me encouraging notes as our family trudged through some dark and messy times! 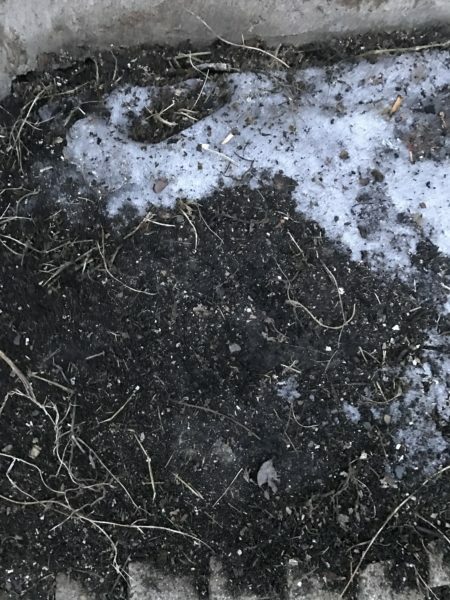 I had to set this blog aside for a few months when it became clear to my husband and I that we would have to do the lead abatement work to remedy the huge siding-gone-wrong fiasco at our house. More on that issue here. It was a massive undertaking that J took time off work for, and that consumed our every spare moment. It was work that we should not have had to do – we took every precaution to hire the right people to deal with the old lead siding safely. Maddeningly, they violated their EPA license and polluted our yard, and the gardens located closest to the house. When the snow melted, the hazard was discovered and abatement was in order. Frustratingly, the process of finding someone to do the job dragged out far too long, so we did the work ourselves. Our kids could not continue living with lead in the yard. While I would have obviously preferred to never have the hazard in the first place, I concluded that it was a good thing that we did the clean-up instead of someone else. With our children, the food we grow, and the chickens that roam all in mind, we were absolutely thorough in removing every single pin-head sized piece of lead paint, and we dealt safely with the hazard. We ended up cutting up half of our grass lawn and tossing it. We also removed the top 4-5 inches of soil from the garden beds around the house. This was tedious work with all the rock boarders we had to remove and wash off, plus perennial plants to dig up and relocate! We invested in an industrial HEPA vacuum and thoroughly cleaned the walks, porch, etc. 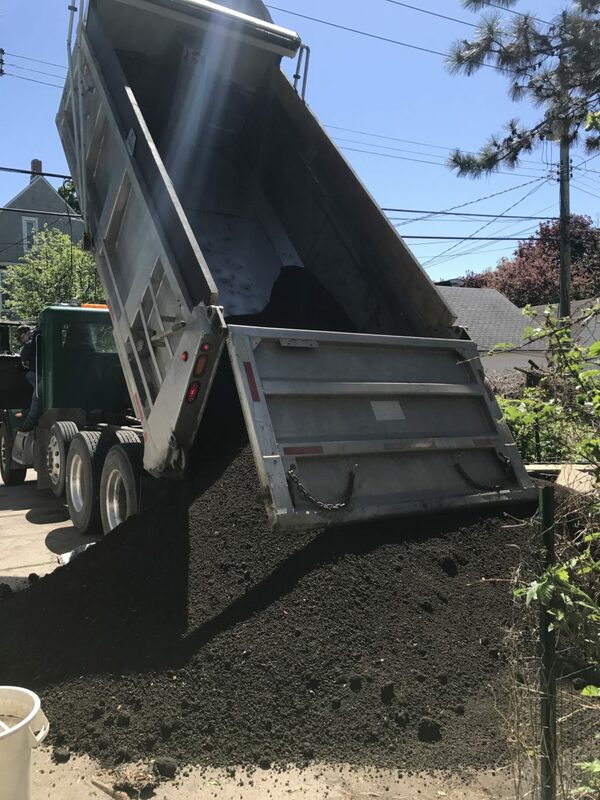 In the end, we filled a 10-cu-yd-sized dumpster with contaminated soil! For as much as we removed, then we had the work of replacing it all! And just because when it rains it often pours, we had to remove and replace dirt twice over! 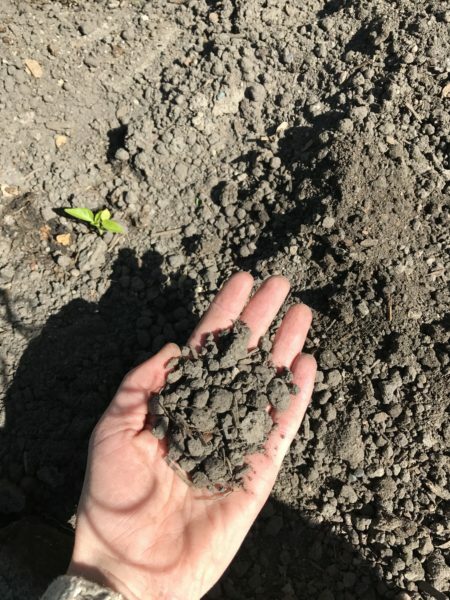 The new soil that was delivered ended up being filled with gravel due to a hole in their screen. 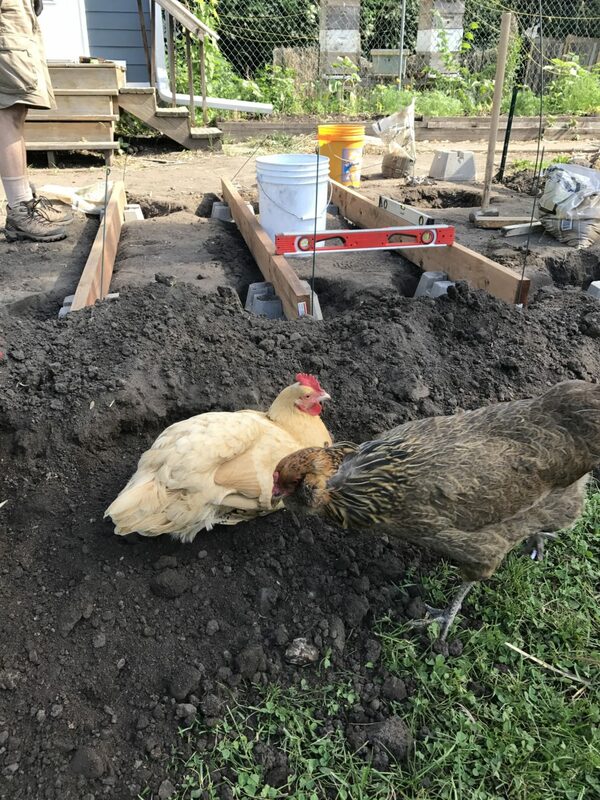 This was unfortunately not obvious to us until we had already filled the garden beds and that first rain washed the dirt off the rocks. It was a chalky mess. Hardly a medium to grow food in! 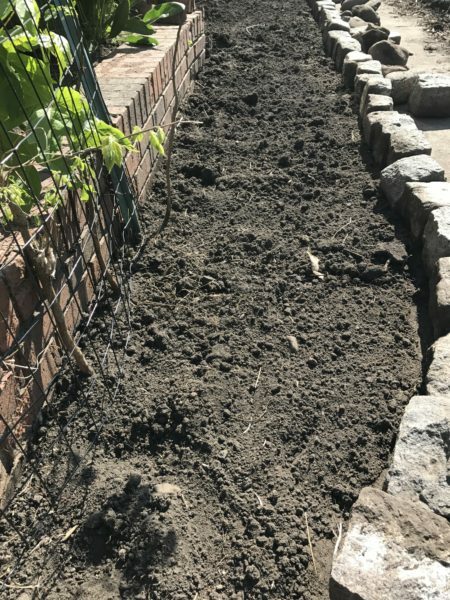 So, we got the shovels back out, removed the rock-heavy dirt, got rid of it however we could, got good dirt delivered, and filled the beds back up with better dirt. WHEW! It was so painful to remember, by comparison, the rich soil that I had built up by regularly amending for seven years! Once the beds were finally filled with better soil, we had a ton of landscaping work to do. Where I had removed perennials to dig out the soil, I filled those beds back up with plants. Then we had the lawn to deal with. Right out our back door, there was a huge dirt pit. Being a high traffic area, with kids running through daily, I didn’t think seeding grass was going to go over well. Sod crossed our minds, but it is chemically grown and needs constant attention between aeration and watering. I’m definitely one to be critical of the social pressure to maintain input-heavy, unsustainable lawns. 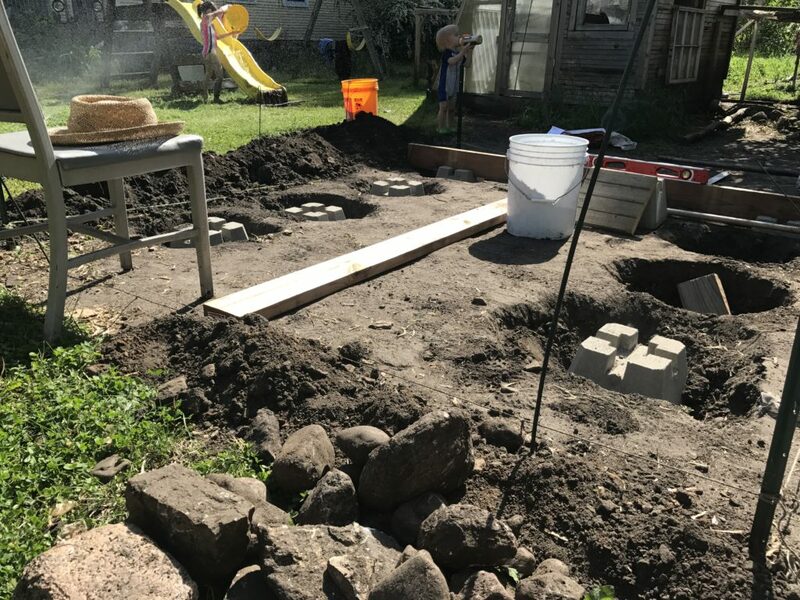 The conclusion, then, was to put in a patio to quickly cover the bulk of the dirt, then fill around it with paths and many plants. This sounded straightforward, but oh, it’s been a ton of work! As always in our yard, every shovel scoop gives us multiple rocks! A patio was never on the project list, but we eat outside every day, so we’ve been really happy with it. Plus, we gained more growing space! 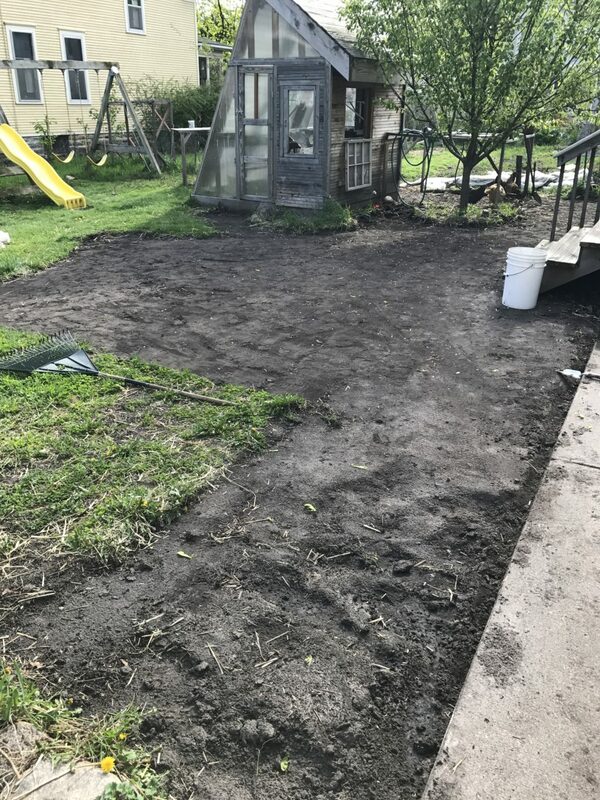 Of the edibles, we added several new types of cooking and medicinal herbs, planted a plum tree, elderberries, red currants, and a saskatoon berry bush. The rest of the growing space is taken up with lots of native perennials (some for dye pots) and flower starts from generous neighbors. My knowledge of flowers and native perennials is in the beginning stages, so it was a bit of a guess how to arrange it all, but things are blooming and bees are flocking! It appears thinnish for now, but in a year or two, it will feel so alive and full. The finished floating deck! The stairs on the left lead into the house while the path continues past more plantings, the new plum tree, toward the garage. 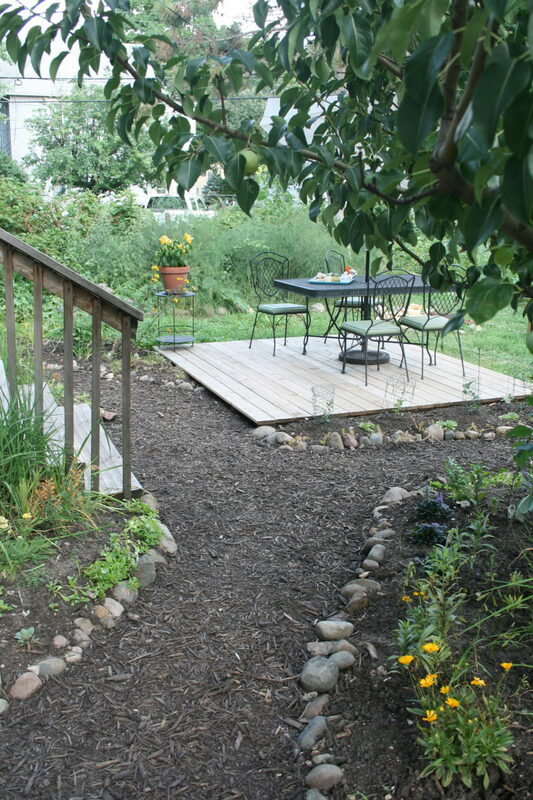 The path on the right goes through more plantings, leading to the chicken coop/greenhouse and into the open play spaces of the yard. All of this work meant that my vegetable gardens suffered severely. Sadly, I estimate that I grew about 1/3 of what I normally grow in there, and the effects are apparent as we rolled through July without much produce. I feel disoriented in the kitchen with no garden harvest to guide my menu, no urgent need to prepare something before it goes bad. It’s a different sort of year. The chickens and the bees have come through alive and well, though! While it has been so sad to not have the garden bounty, I’m taking it as opportunity to step up my Fall gardening game, and plant a solid crop of things I do not always get around to. Stay tuned! Sorry you’ve had such a nightmare, but you’ve come out of the other side with a healthy garden so hopefully things will go well from now onwards. Your hard work is a real inspiration. Love the patio. I have one outside my back door too and it’s a nice place to be. Please post what you are planting for fall! I wondered what happened to you and yours. I thought perhaps you were so busy with gardening that writing fell by the wayside. Despite all the disappointment and work, you can feel comfortable and healthy now. I hope the fall veggies grow well for you. Glad you are back! Lead is not a fun thing to deal with and I am sorry you had to go through everything you did. It sounds like your hard work has created an even better space. It is also wonderful the chickens and bees came through just fine and your family is safe! Your tenacity, work ethic, and commitment to a healthy, nurturing environment for your family are inspiring. We’re proud of (and thankful for) you. Aww shucks, bro…Thanks for dropping a big deposit in my bucket to keep me going! Congrats on taking the hard route – your work and dedication have paid off with a beautiful new landscape! !